This is my third Christmas in this house, and as I look back at previous photos I just love how it feels more like home each year. It also looks a lot less bare, too! We moved from a small cottage-style home that I absolutely loved, but we outgrew it as a family of five. The last Christmas in that home felt so right because the house was finally completed, and the decorations just made it extra special. 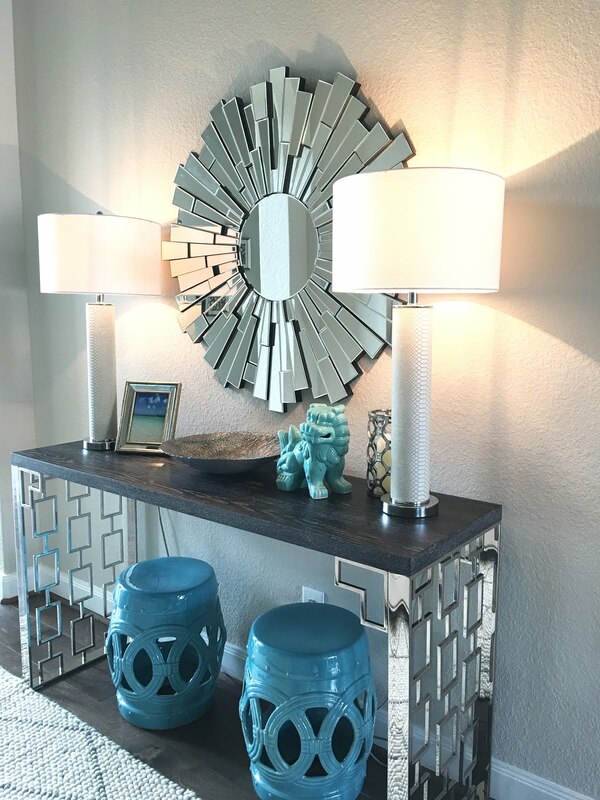 It was hard to start over in a new home and decorate from scratch because I knew it would take time to get things just how I wanted it. I'm still not completely satisfied, but the to-do list is getting shorter. There's something about seeing the progression almost exactly one year later that makes me realize how far our home has come. I've finally stopped calling it the new house, too. It's just home now, and it feels even more special as I decorate each room for the holidays. Come in and take a look! I absolutely love my new front door wreaths! I bought them at Home Depot and they are so realistic. The best part is that they are battery operated and work on a timer. Everything is on a timer in my house, from the tree to the candlesticks on the fireplace. I can't imagine having to remember to turn everything on and off every night. The entry is similar to last year, but this year I used so many more ornaments. I kept the traditional red, but added gold instead of silver. The glitter bows are new as well. I always have poinsettias, but I used three potted per planter this year. They were only $4 each from Wal-Mart so it wasn't too expensive. It's the best all lit up at night. There's just something about Christmas lights! The view looking out to the street is just as special. My husband has wanted to use blue lights for years. He finally got them this Christmas! The view from the front doors all the way to the backyard is one of my favorite features of my home, but especially during Christmas when you can spot the lights of the tree. I moved it to the center of the living room instead of the corner for that reason alone. My reindeer got a new poinsettia garland around his neck this year. He's probably my favorite Christmas decoration, and I change up his look every year. You might notice this side of the foyer got a blue makeover with new art and a throw pillow. I'm loving everything blue lately! I love these new white stars I bought at Hobby Lobby for the stairs. They were only $6 each, but make such an impact. The view of the stairs from the dining room. I absolutely love the way the dining room turned out this year! I wasn't too sure how I was going to like this much white, but the fresh greenery on the table and the mini wreaths really ground all the lightness. The star of the show is my new 12 foot tall Christmas tree! It was a beast to decorate, but so worth it. My candles are on a timer and come on right after the tree does at 5:30. I just love the ambiance in the evening. I take back every mean thing I said about how terrible these candles looked when I first opened the box. They are definitely better from a distance than on my dining room table. I might have gotten carried away with the pictures this year! Looks great! Love seeing it all come together. Tour house is huge! I can’t imagine all the work it takes to look this good! Thank you! I did start November 1st to get it all done by Thanksgiving. Stunning!! Love it all... The entrance, that reindeer, the dining room, the majestic tree... And the list goes on. You did an awesome job!